It’s too bad we didn’t have the Hubble or something like it a hundred years ago. It would have saved a number of people chasing total eclipses all over the world, with bulky telescopes and other gear in hand, to confirm or reject one of the more spectacular predictions of Einstein’s theory of general relativity, first published exactly 100 years ago: the eerie bending of space-time by sheer mass and gravity. Just became my new desktop background. I have recently joined the population of Layoffsville, so it’s good to know the universe has a sense of humor. 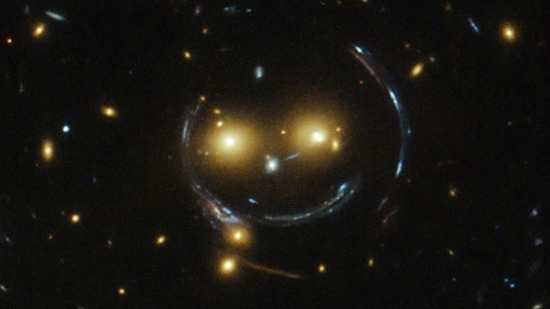 “Maybe the cosmos has a sense of humor ..” but the main thing is that we do! Great image in both senses of the word – you can’t get much greater in size or awesomeness! I won’t be convinced the cosmos has a sense of humor until the Platypus Nebula is found. Where can I get the T-shirt?